Rink Rover: Lewis Carroll to Leafs TV: "Take care of the sense, and the sounds will take care of themselves." Lewis Carroll to Leafs TV: "Take care of the sense, and the sounds will take care of themselves." A farcical sideshow is threatening the integrity and value of NHL hockey right now. Unfortunately, the league has done nothing to protect its assets from being brutalized by one-dimensional "contributors" to the game. I am, of course, referring sportscasters who abuse alliteration in order to offer "clever" observations about the game. These one-dimensional rhetoricians are bludgeoning the English language into a senseless heap of words dislocated from their former meanings. The league must do something to protect the English language, one of the league's most valuable assets as most markets are predominately Anglophone. The main offender behind this fiasco is Joe "the Voice of the Maple Leafs" Bowen. Of course, he'd probably refer to himself as the "spirited speaker of the sap-spewing shrubs." Now, I have nothing against Joe Bowen personally, but someone has to call on him out in order to stop his ongoing accumulation of alliterated atrocities. See? This corrupt style has even spread to its detractors. Soon we will all speak in sumptuous sounds that make scarce sense. The source of this disease can be traced to the Toronto Maple Leafs' facebook page. Before every game, the team's account posts a picture capturing the alliteration of the day. We are less than a full month into the new season, and this gimmick has already degraded into elaborate nonsense. Here's a timeline outlining this literary device's decline into absurdity. On October 8, this picture was posted ahead of a game against the Colorado Avalanche. So the goalies are hockey royalty whose official residence is named after the thing that they doggedly try to prevent from ever entering their domain? As strained as the logic in this Bowenism is, we can still understand (and excuse it) as a heavy-handed attempt at irony. After all, if beating us over the head with irony were a crime, George Orwell would have been imprisoned for wiring Nineteen Eighty-Four, in which the Ministry of Truth rewrites history to please the government; the Ministry of Love oversees torture; and the Ministry of Subtlety curates Orwell's works. Irony also informs the picture used ahead of a game against the Nashville Predators on October 10. 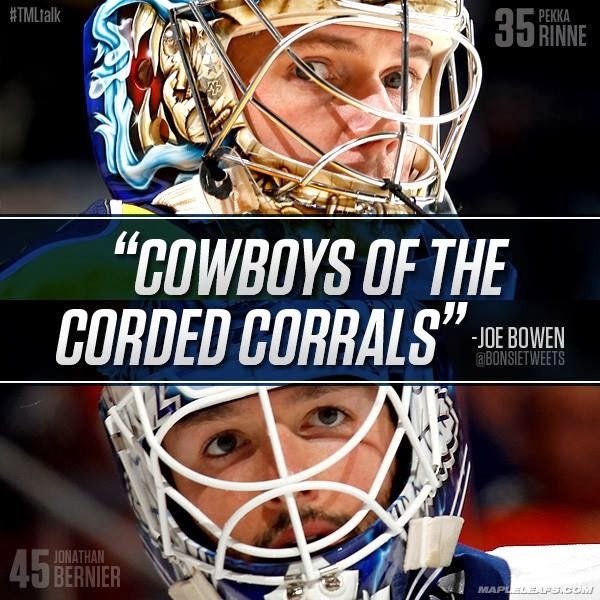 The problem with this phrase is that goalies, unlike cowboys, do not want to corral things (e.g. cattle, pucks) into their own nets. This faulty analogy might have been funny had Jonathan Bernier not inadvertently corralled the puck into his own net one week later. It's safe to say that the hockey gods took Bowen's comments as a curse upon Bernier. However, Bowen took no responsibility for foreshadowing Bernier's own goal. 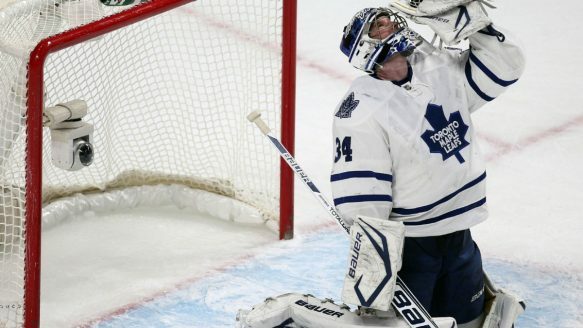 Rather, he suggested (as you can hear in the clip above) that Bernier had learned this trick from former colleague Jonathan Quick, who had redirected a puck into his own net earlier that month. Thus Bowen deflected culpability for the own goal toward the Los Angeles Kings' coaching staff. To recap, we've moved from silly irony to ominous irony. From here on in, Bowen's alliteration lose sight of making any sense. Apparently, some populist uprising has taken place and the aforementioned "puck palace" has become the "disk dungeon." 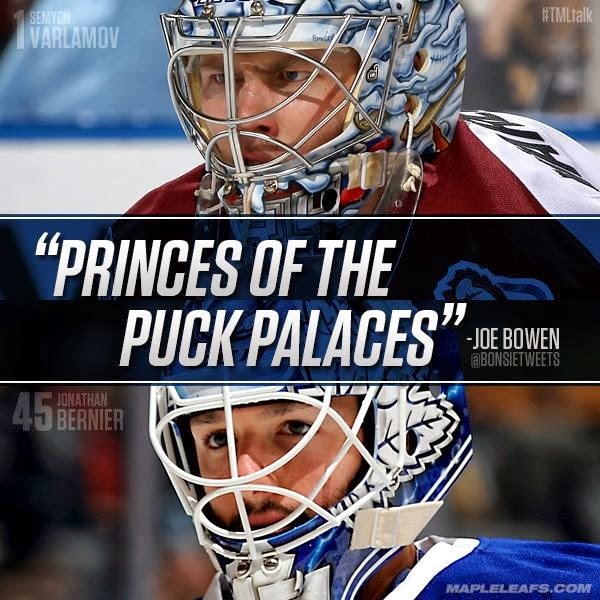 Just as the last Tsar of Russia and his family were imprisoned by the Bolsheviks in the Winter Palace, the pucks, with which the Avs handed the Leafs their first loss of the season, have been confined to a former symbol of their power and grandeur. There they will remain until the time of their execution. The above analogy seems ridiculously strained because the "disk dungeon" metaphor makes no sense. Prison guards are hired to keep inmates in prison, not to prevent them from entering the penitentiary as goalies try to bar the puck's path into the net. This analogy comes close to affronting the concept of jurisprudence by likening the law to a game. Fortunately for Leafs TV, this quip is too nonsensical to be subversive. The real dungeon here is the press level where alliteration has been put on the rack in order to offer strained sentiments on the game. Perhaps sensing that his alliterations were becoming increasingly anti-establishment, Bowen's kenning ahead of the game against the Anaheim Ducks on October 22 was less politically volatile. However, his rhetoric levels a caustic criticism at the Leafs nonetheless. Instead of forecasting an own-goal, this comment reflects negatively upon the Leafs' defensive woes. A "gazebo" is generally defined as "a freestanding roofed structure usually open on all sides". So the net is gazebo-like in the sense that the Leafs' defensive breakdowns make it open to entry from all sides!? Does Bowen secretly hate the Leafs? Once again, nonsense appears as a form of saving grace. 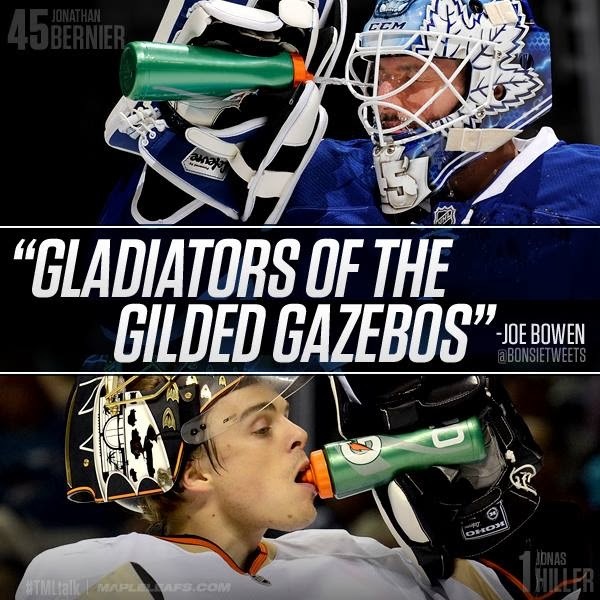 While goalies might be likened to gladiators, their nets are not and probably have never been gilded. Here's James Reimer in a net typically used in hockey games. Now here's James Reimer in a gilded hockey net. Reimer collaborates on his off-season training regimen with Drake (featuring T-Pain). Normally I wouldn't raise such a fuss about the eccentricities of one sportscaster, but the plague of alliteration is spreading throughout hockey coverage. Earlier this month, Mark Lee of Hockey Night in Canada credited Carey Price with a "scintillating save" during a game against the Vancouver Canucks. Was the save truly a "brilliantly lively, humourous, or witty" maneuver, or has alliterative athletic analysis assimilated another analyst?